Most people experience instances in life, when fate doesn’t seem to go in the right direction. 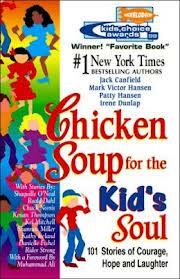 When times are blurred by salty tears, or deep internal pain, Chicken Soup for the Kid’s Soul may sooth one’s melancholia, with profound, mostly true anecdotes from a kid’s personal past. Some will cause an eruption of laughter to explode from you; others might prompt crying. Either way, the stories may change a persons view on life, as many go though the same struggles, and, including much worse. This book is organized beautifully by four primary authors; Jack Canfield, Mark Victor Hanson, Patty Hanson, and Irene Dunlap. Cherish each word, learn from other’s mistakes, and be stupefied at countless kid’s incredible heroism.